Find out what S3DA is all about! The mission of the Scholastic Archery Association, DBA Scholastic 3-D Archery, program is to foster, educate and guide youth in the areas of 3-D, indoor target, and outdoor target archery as well as safe, ethical bowhunting practices. Scholastic 3-D Archery will design, promote and foster national youth and high school 3-D and target archery competition as an after school program affiliated with educational learning institutions, sportsman’s clubs and archery dealers. Scholastic 3-D Archery is a program that has exploded across the country in the last three years. Starting in only 3 states at their first national tournament, S3DA is now active in 38 states and growing tremendously. S3DA is growing so rapidly for many different reasons. One reason is that S3DA is an entirely after school initiative that can be run through not only schools, but archery shops, churches, ASA clubs, firestations, etc. Students are attracted to S3DA because they are free to use any equipment of their choice, from any brand or company, only restricting speed limits based on the age and shooting division of the students. Along with them being able to choose their own equipment, they are also able to progress through the sport as they grow and develop. Each S3DA class provides a natural progression that helps students grow from elementary school through high school and it allows them to move straight into shooting at the collegiate level, where they are earning scholarships to shoot archery. Not only are students attracted to S3DA, but their families as well. All of S3DA’s events are family oriented and family friendly! For all of these reasons and more, S3DA has become one of the fastest growing archery programs for our youth in the U.S! As mentioned before, the natural progression of our program allows students to grow and develop throughout their archery career and then move into the collegiate level. 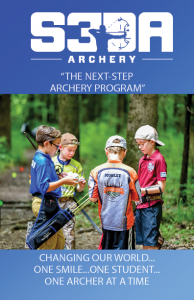 S3DA partners with the U.S. Collegiate Archery Association and USA Archery to ensure students a natural progression from elementary school through middle and high school and on to college. These partners allow colleges across the nation to see the potential S3DA archers can bring to their archery programs. Students in S3DA have the opportunity to earn college scholarships based on their performance at S3DA events. The S3DA National Tournament saw students walk away with more than $4 million in college scholarships. This does not even take into account the thousands of dollars won at regional and state competitions across the country. Students participating in S3DA events are also being taught about fair chase and ethical bowhunting, as well as wildlife conservation. Check out more information regarding this on our conservation tab! Meet Our Sponsors with more information on the Sponsors tab! Due to recent popular movies highlighting unrivaled archers, the focal point of the media on archery in the Olympics and the success of the youth archery programs, many students have become interested in learning the skills of archery. Coaches and principals are asking for archery instruction for those students who wish to participate in the ever growing popular sport. Simply put, more archery instruction is being requested, and 3-D and target archery are the most popular choices by the educators, students, and parents. Each of our Scholastic 3-D Archery Board Members brings a wealth of knowledge, experience and established credibility that will enable us to move this program across the country at a very fast pace.